Buy Superfine Texture Paste Online. COD. Low Prices. Free Shipping. Premium Quality. 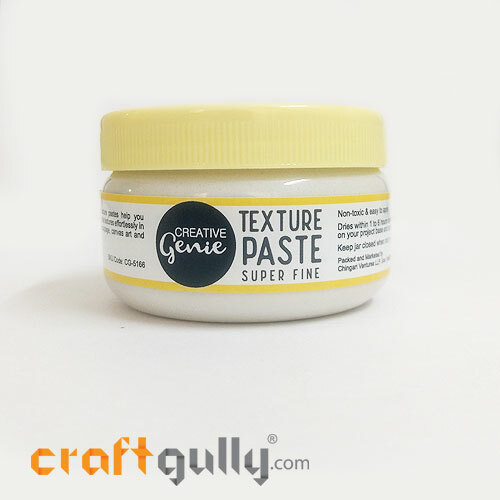 The Creative Genie super fine texture paste is great for creating subtle grainy textures for your backgrounds in your decoupage, mixed media, stencil art, cnvas art, and other DIY projects. This paste is non-toxic and very easy to work with. You can use palette knives, texture tools or even your hands to work with this pliable texture paste to create your own look and feel. Drying time is between 1 to 6 hours depending on the thickness of the paste applied. Keep jar tightly closed when not in use.